With winter ice storms, spring thunderstorms, and summer tornados, Nashville has its fair share of power outages caused by nasty weather. Everyone has experienced a temporary loss of power, and some have even experienced power outages that last for days. If you’re part of the latter group, you know how difficult it can be to go more than a few hours without power in your home. It’s probably led you into a thought pattern of purchasing an emergency backup generator for your residence. To help keep your home powered, come what may, a backup generator may be exactly what you need in those circumstances of power loss. The huge convenience of being able to keep things running after a debilitating storm usually outweighs the added cost of having a generator. If you’re still debating, or just researching the topic for more information, then you’ve come to the right place. At Gervais Electric we’ve compiled this useful guide to help you through the consideration process. What necessities run on electricity in your home? For most homeowners deciding to get a generator depends on what essentials need electricity to run such as your heating/cooling system, hot water heater, refrigerator, oven and stove, etc. Many of these items can run on gas, so the first step is to find out what your essential appliances use. If you find that your most important appliances run on electricity, that will help guide you down the path to finding the right size generator for your home’s power needs. Do you have enough outdoor space for a backup generator? Generators come in all sizes. From small, portable generators, to permanently installed standby generators much like the footprint of an air conditioner unit. Smaller generators typically run on batteries or gasoline whereas the larger standby units run on gas or propane. If you go with the more affordable, portable generators that run on gasoline, you will need to make sure you have a safe place to operate it outdoors. A covered, open-air area for proper ventilation at least 15 feet from your home is best to avoid carbon monoxide fumes entering your home. A single-family home may offer you plenty of room for this, while an apartment or multi-family building will not. Keep in mind that a gasoline generator will also require space for backup fuel to be stored safely in plastic fuel cans. There are generally three main types of generators: portable, inverter, and standby. 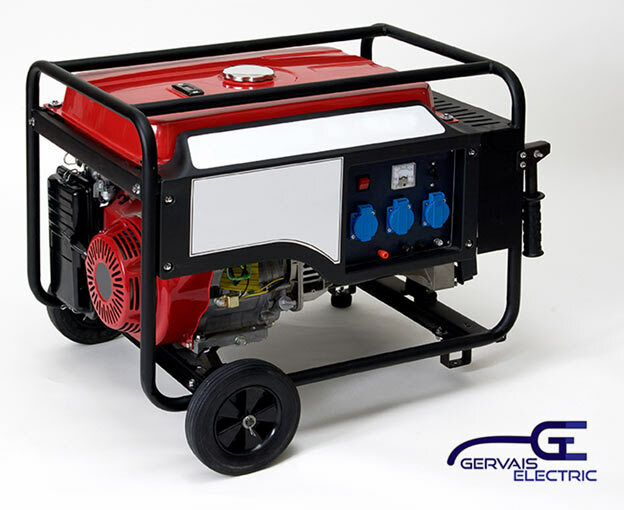 Portable generator: A portable generator is powered by gasoline or diesel fuel and is good for providing temporary electrical power. Portable generators usually provide enough power to run a television, a freezer and a refrigerator. Depending on your needs, this may be the perfect fit as a backup generator for you during a temporary power outage. These can be purchased at your local home store. Inverter generator: An inverter generator produces AC power with an engine connected to an alternator. AC power produced by the generator is converted into DC power by use of a rectifier for standard usage with home electronics. These generators produce high levels of performance, but they usually come at a premium price. Inverter generators are much more efficient than a standard portable generator because the engine automatically idles up and down depending on the demand that’s needed at the time. It will still run on gasoline or diesel but will not need to be refueled as often as the standard portable generator. These can be purchased at your local home store. Large versions of these generators can be wired directly into your electrical panel with a transfer switch to power your entire home. Mid-sized and small, recreational version of inverter generators can also be purchased but they will not wire directly into your electrical panel. Instead, you will individually plug appliances into the generator. Standby generator: A standby generator is a more permanent type of generator that can be installed at your home. It is a great choice as an emergency backup generator because it is wired directly into your home’s electrical panel and typically runs on propane or natural gas. The standby generator operates automatically during a power loss by sensing in only a couple of seconds when a power outage has occurred. It also delivers permanent power protections as a standby generator with an automatic transfer switch for safety. The standby generator can easily power your entire home electronics, heating and air conditioning system, as well as lights and hot water. This type of system will need to be installed by a licensed electrician. Never attempt to wire directly into your electrical panel unless you are a licensed electrician! If you’re interested in learning more about installing an emergency backup generator in your home, contact the friendly team at Gervais Electric for a no-hassle consultation. Reach us at 615-973-1436 in the Nashville area, or send us a message below and we will get back in touch with you shortly!